An unusually transparent galaxy about the size of the Milky Way is prompting new questions for astrophysicists. 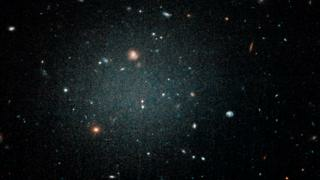 The object, with the catchy moniker of NGC1052-DF2, appears to contain no dark matter. If this turns out to be true, it may be the first galaxy of its kind - made up only of ordinary matter. Currently, dark matter is thought to be essential to the fabric of the Universe as we understand it. The authors of the study weren't initially on the hunt for a dark matter-free galaxy; instead they had set out to take a closer look at large, ultra-diffuse galaxies. These are similar in size to the spiral galaxies we're more familiar with, but have a fraction of the number of stars. When Prof Pieter van Dokkum, lead author of the study, first spotted NGC1052-DF2, "I stared a lot at that image and just marvelled at it... It's like this ghostly glow in the sky." The galaxy has very few stars, but many of them are grouped together in unusually bright clusters. When the team studied the behaviour of these clusters, they found that the stars seemed to account for all of the galaxy's mass. Leaving no room for dark matter. This is not the case for most galaxies. "There's about five times more dark matter in a galaxy than regular matter," explained Dr Michelle Collins, a physicist at the University of Surrey who was not involved in the study. "As you go further out from the galaxy you have fewer stars and more dark matter. The dark matter halo is much more extended than the stars are in a galaxy," she added. As it has greater mass than normal matter, dark matter is believed to hold the necessary gas together while galaxies are forming. "So this galaxy would have to form a different way: maybe from interactions within gas that's flowing into or blowing out of a larger galaxy," North Carolina State University astrophysicist Dr Katherine Mack told BBC News. "It's not just galaxies," explains van Dokkum. "The entire fabric of the universe is really the scaffolding of dark matter and everything else is pasted on it." For Mack, the most exciting aspect of this galaxy is its potential to prove that dark matter - until now widely theorised but not directly observed - is real. If dark matter were just an unexplained effect of the gravity from regular matter, its effects would be visible in this galaxy. "So it only makes sense if dark matter is a real substance, that can be present or not, separately from the regular matter," Mack added. The team has another paper forthcoming that will take a closer look at the bright star clusters, and may unravel more of NGC1052-DF2's mystery. More work remains to be done on this and similar objects before dark matter theory needs to be fundamentally altered, however. "You always have to be careful to say it's the first of anything," says van Dokkum. "It's certainly the best candidate for a baryonic [ordinary matter] galaxy." Dr Collins is cautious to conclude that the galaxy has no dark matter halo, based on the current evidence. She notes that there may be other galaxies with unusual and unexplained features, but technology will need to improve before they can be properly observed. "We have some galaxies nearby that show some similar properties but they're much fainter. They're much smaller objects," she told BBC News. Dr Richard Massey, a physicist at Durham University, agrees: "I'm genuinely very impressed with the work, and I'd use the conclusions to say that we should stare at these objects a lot harder for a lot longer - but I wouldn't conclude anything profound about dark matter quite yet," he told BBC News.